Former army captain Haydn Ayres has entered farming with a purpose. Danusia Osiowy finds out how one life-changing moment three years ago overhauled his entire future. When captain Haydn Ayres was told he could no longer continue as an active serving officer in the British Army, time stood still for a while. Having joined the cadets at 13, attended the Welbeck Military College and graduated from Sandhurst, he was commissioned as a second lieutenant. Working within the military ran through his veins. His future was bright and his plan was to lead a full military career. In 2014, he had returned from a tour of duty in Afghanistan before working as an operations officer for the Queen’s Gurkha Signals in York shortly after. But in March of the same year, Haydn was involved in a severe road traffic accident while travelling as a passenger en route to a training exercise. The catastrophic impact saw the driver of the vehicle killed at the scene and Haydn with no option but to spend the next two years in rehabilitation at the MOD’s dedicated rehabilitation centre, Headley Court, in Surrey. Intense rehabilitation followed, where he spent nine hours a day as part of a month-on, month-off recovery programme. During his time there, Haydn met with an occupational therapist to determine what hobbies he could pursue as part of his rehabilitation and that’s when he discovered HighGround – a charity dedicated to helping military leavers make the transition into ruralbased industries. Here he learned the basics of horticulture and, in his own words, loved every minute. The concept for a smallholding grew organically as his knowledge began to increase. Initially it was simple things, such as planting trees and visiting other farm units, before more hands-on work, rearing chickens and helping at lambing time after the charity put him in touch with two farmers in the Pennines. He also attended the charity’s Rural Week initiative, which highlights the range of rural sectors and the opportunities within them. During his time at Headley Court, Haydn knew he must come up with a new plan that would allow him to work around his physical limitations, and which he would find as challenging and fulfilling as military service. He and partner Naomi, who continues to work in the army full-time and hails from a farming family, already had long-term dreams to become farmers, but now were in a position where they didn’t have to wait any more. “Our plan for post-army life had been to farm sustainably on a small scale and run an environmentally friendly glamping site,” explains Haydn, whose father is a builder and mother is a receptionist of a caravan park. “And, after being inspired by HighGround, Naomi and I decided to bring this plan forward by a couple of decades.” In 2016 he was medically discharged with permanent damage to his left leg, and other injuries to his shoulder and back. 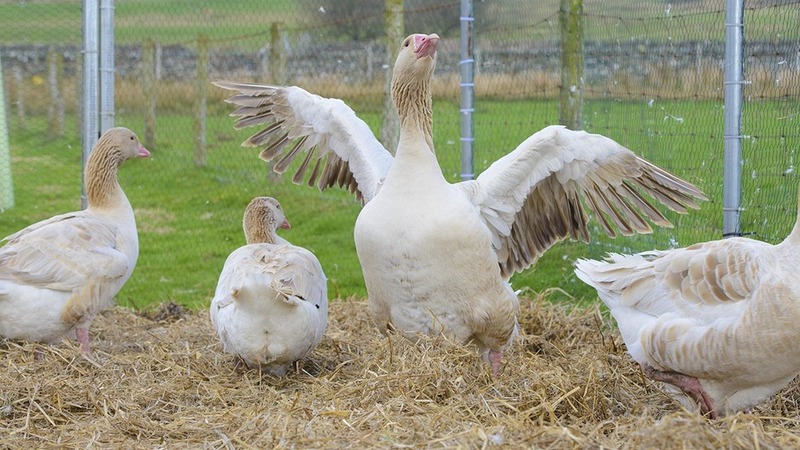 Eight days later he married Naomi, 34, and within two weeks of their wedding had their first sheep, geese and chickens. Prior to his discharge, they had already purchased a smallholding and now have ‘two precious acres’ at Betws-y-coed, North Wales, using his redundancy and savings. They were also lucky enough to have been offered an area of rough grazing about 10 miles away after being introduced to a landowner through their local vicar who was looking for a grazier on some of his fields. Some of the stock is also housed at Naomi’s parents’ farm in Rugby, Warwickshire, over the summer, and the couple are regularly down there to take care of the animals there. 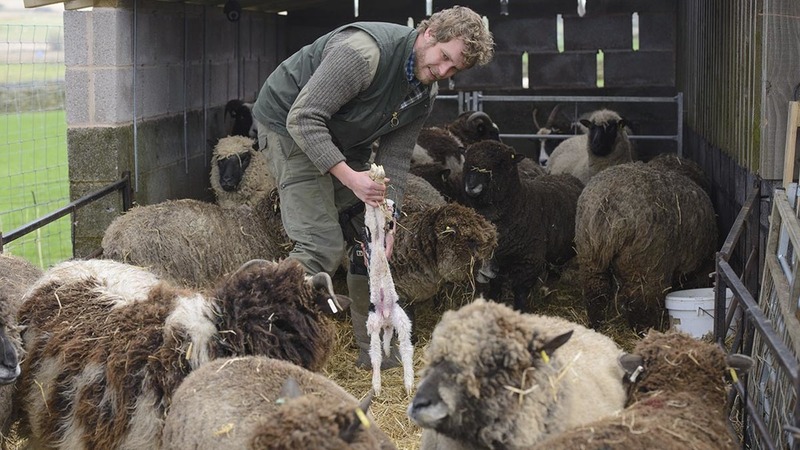 Since then, they have grown their holding steadily and now have 37 Coloured Ryeland ewes, Jacob and Llanwenog sheep spread across three locations, as well as a proliferation of rare breed poultry. Purchasing their animals takes place through shows and sales, with some private sales. “We have learned some tough lessons in our first six months, none more so than the fact that acorns are poisonous to sheep.” The couple were also targeted by sheep rustlers earlier this year, losing two Jacobs and two Coloured Ryelands. 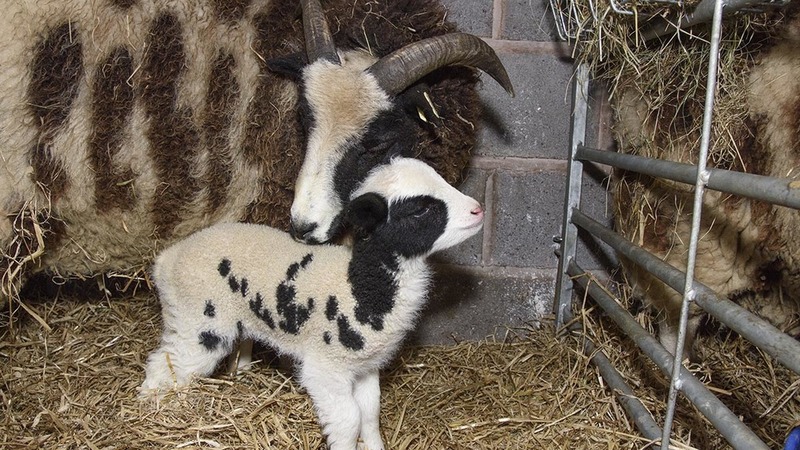 The stolen lambs were pedigree stock which were earmarked for breeding from next year and came and came as a huge blow, particularly as one of the Jacob ewe lambs was a wedding present from the farmers that Haydn undertook a week of lambing experience with last year. It has been an incredibly steep learning curve for the 30-year-old former captain of the Royal Corps of Signals, who had no previous exposure to agriculture beyond having visited Naomi’s family farm for Christmas and birthdays. He has had to come up with ways to mitigate his physical disability, which can be challenging, especially given they have no handling facility yet for the sheep. A key focus is adopting a low input, grassbased system achieving quality meat from forage. “The advantage of farming in this respect, as opposed to paid scheduled employment, is for many tasks I can choose when and how I do them,” he explains. “I work harder on the days when I can move to make it easier on the days I am in pain. The couple plan to grow the business and will need to find a larger property in order to do so. “We ultimately aim to operate a small but sustainable farm focused on traditional breeds with the twin aspirations of improving our landscape and engaging constructively with the wider community. “By the end of 2017 we want to be in a position to sell our own slow grown, grass fed, traditional breed lamb, initially to family and friends and then more widely at a premium. “We also want to be selecting and retaining our breeding stock based on measured analysis of performance against the criteria which are critical to our business plan as well as selling pedigree breeding stock. “It isn’t a quick job and there is no single channel we can rely on. Niche they maybe, but an afternoon in their company demonstrates they are anything but hobby farmers. “A lot of people think smallholdings are a hobby but we don’t run it like that as it has to be financially viable to support me now I am out of the army,” says Haydn. “We have to be ruthless with culling decisions and just because they are cute and we like them doesn’t mean we should keep it.” The couple hope to diversify and tap into the agri-tourism market. “Research on Google Trends shows more and more people are choosing to holiday in the UK and we can’t envisage that is going to change,” he adds. “Tourism seems to be booming in Wales and there must a way of tapping into that. For Haydn and Naomi, farming isn’t just about making money and embracing the lifestyle, it is also their chance to give something back to the landscape. “It’s beautiful around here and we need to protect that. We have planted trees around the field boundaries, which we probably won’t see grow for long but we know we have improved it during our time here.” For Haydn, there has been little time for looking back since his release. In fact, it’s all about moving forwards and creating a happy future. Listening to a wise voice on younger shoulders is testament to his humility and life experience – qualities you can’t help but feel rather humbled by. “When I found out I was deemed medically unfit for duty I was shocked and it took a while to sink in,” he says. “I thought I would be there forever, but the more I looked into it the more I realised I was entering into an exciting industry which was going to be a challenge. “I love getting up early, being with the animals and undertaking physical work with enthusiasm, so at the end of the day you are physically tired and know you have put a good day in. “That’s the discipline and work ethic I learned from the army. It teaches you to know your limits and I know hard I can push myself. “When I was an officer I was in the freezing cold, frostbitten in training and digging up trenches in darkness, but I got through it and you know no matter what you are going to be okay and you work through your pain. You think you are going to give up but you just don’t.